– Kishore Biyani, managing director of Future Retail on Big Bazaar Direct. There are mainly two keywords in his statement: “If” and “Bigger”. And if this statement is even 1% true, then the Indian retail industry will never be the same again. 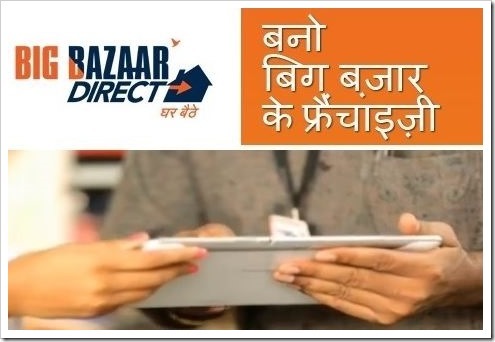 Big Bazaar Direct is a new venture by Future Retail, which owns Big Bazaar outlets all over India. Big Bazaar is itself a Rs 11,000 crore business trying to claim its own share in the vast Indian retail industry. If Big Bazaar Direct aims to grow bigger than Big Bazaar itself, then definitely it’s a huge gamble to bet on. Although there is a requirement to pay in Rs 3 lakh to become a franchisee of Big Bazaar, there is a strict selection process as well, through which only the most eligible and capable entrepreneurs are selected. Goods are delivered after 3 to 7 days. As the franchisee has to stock no inventory and is relived of shipping and delivery tensions, this seems a very good model as least on theory. So, the big question: Will Indians adapt it? Such is the branding of Big Bazaar inside India that more people know about this brand, compared to those who actually visit it and shop from its outlets. This is a huge opening advantage for Big Bazaar Direct, but it also brings huge expectations from Big Bazaar. Right from the instant a franchisee drops in to take orders to the final product delivery, every step should be carefully managed and optimized by the Big Bazaar Direct team. What if the products are not delivered or the delayed? The customer who orders toothpaste would need that next day! To start with, Big Bazaar Direct would only offer 1000 odd products via its interface on a tablet. Compare this to over 10,000 products which a consumer typically gets to choose from inside a Big Bazaar actual outlet. Less product variety can severely hamper the overall shopping experience of the end user. Initially, tablets would offer products from groceries, electronics and furniture niches and strictly no perishable items would be offered. Although this direct selling methodology brings in much convenience and ease of shopping, Indian shoppers are spoiled for choices. It would be interesting to see how Big Bazaar Direct manages this shortcoming. There is immense excitement and optimism regarding this new franchisee based business model introduced by Big Bazaar. Hoards of young men and women with somewhat little experience in retailing are applying for this new opportunity. Even insurance agents and direct selling professionals are trying out their luck to enter this eco-system. Maybe it’s a false sense of optimism: retailing is all about being patience and building relationship. The local kirana store owner has been with us for several decades, and the wonderful home delivery system which he has organized is a product of his love and patience for the business. When the new franchisees who is armed with tablets and ecommerce, and a big brand behind them enters your home to take orders, he would expect instant returns on his investment of time and resources (including Rs 3 lakh which is required to become a franchisee). But unfortunately, there won’t be any instant ROI. Margins of profit are very less in retailing and it is the repeat orders which bring in slow profit, drip by drip. With normal commissions of 3 to 7% of most products, it would be a long battle for the franchisee to recover his investments and secure profits. Will the impatient franchisee wait for 3, 5 or 10 years to get profitable? And God forbid, if the customer gets any bad experience with Big Bazaar delivery of products, then it will further delay the income generation process. What do you think about this new business model introduced by Future Retail? Would you apply for being a franchisee of a famous brand and sell their products? Are you willing to invest Rs 3 Lakh and visit customer’s home to take orders? Please share your views and insights in comments section! In addition, seemingly if the franchisee thinks he can recover his investment (3 lacs for what, needs to be known first, it appears a win for Big Bazaar for now) and make profits that more people will come forward and participate in this idea. Franchisee benefits are directly related to the consumer interest. 1. would i care to wait for a Big bazaar franchisee to take orders from me for my oil, shampoo, vegetables and how fast would that delivery be ? i cant wait for it. i would prefer my kirana store over it. The model is good but it requires a change of mindset and genuine benefits to be passed to the customer. Each franchisee will also have to work in great unison and as the number of customers associated with a franchisee increase, the tougher it shall get, besides there is no guarantee that the customer will only order via big bazaar guy. He has other eCommerce sites to make purchases from, besides what does a big bazaar offer that can be delivered to me at my doorstop timely with maximum discounts. And when Big B does that would the nearby kirana shops not do anything to get back their customers. Not going to be so easy. A fair number of challenges in pipeline from products, to delivery to pricing to the overall trend. I personally think, Big Bazaar is only trying to test a model as it began recently did by joining hands with ebiz. It should not go away from it’s basic idea of reaching out to people and let it not become a NM Co. It has to understand it’s core competency and am sure it’s just another test unless Big Bazaar is committed to see is happen and will leave no stones unturned to make it a hit. I guess for now this move seems, more of an innovative attempt and the fruits of the idea come only as there is a change in the mindset of the customer, unless there are some exemplary benefits which actually come to the customer.